Revcontent is my favorite native ad network by far. I love them for multiple reasons. One, I like cheap traffic… and they have PLENTY of it. Two, they’re very lenient on what you can run. As long as you’re not promoting anything illegal or making ridiculous claims that you can’t prove… you’re golden. NOTE: They’ve recently cracked down on advertisers making claims in their ads and on their landing pages. Be very careful when creating your ad copy and landing page copy. Three, they don’t charge you based on where you’re sending the traffic. Some native ad networks have three different tiers of pricing. Here they are in order of least expensive to most expensive: Non-Advertisement, Advertorial, and Advertisement. Revcontent doesn’t do that. They don’t care if you’re sending traffic to a squeeze page, a blog post, or even a sales page. The CPC’s stay the same. Before I dive into the case study, I want to briefly explain what native ads are just in case you’re not entirely sure. In short, native ads are ads that blend into the content that’s surrounding them. They’re supposed to look like more content. I’m sure you’ve seen ads like this. You can typically find these ad blocks at the bottom of a blog post or in the sidebar of a blog. They’re all across the internet. Some of the more popular native ad networks are Taboola, Outbrain, and Yahoo Gemini. While those networks are great, they’re pretty pricey (on a “per click” basis). There are many other less expensive native ad networks you can use though. My three favorites are Revcontent, as you already know, MGID, and Content.Ad. Content.Ad is one of those networks that charge you based on what type of page you’re sending the traffic to. What’s cool about these two networks though is, they don’t care if you’re a product owner or an affiliate. 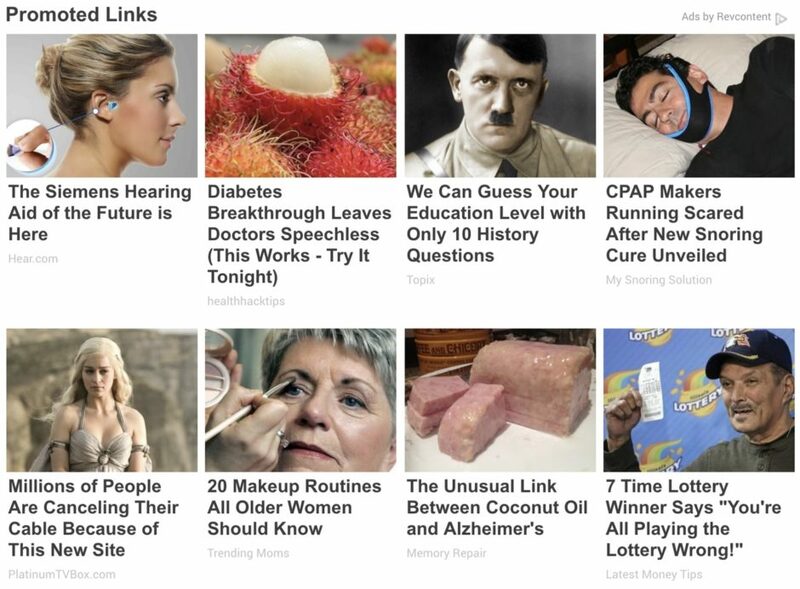 In fact, in the image above, 4 out of 8 of those ads are affiliate ads. And, one of those ads is promoting the product I promoted in this case study. This is a really simple affiliate marketing business model. When using native ads to promote affiliate products there are really only a few moving parts. I’ll break it all apart for you below and at the same time, I’ll show you my exact campaign so you can follow along. This is where you start with this affiliate model. Keep in mind that there’s little to no targeting options available for native ads, other than placements (where you want your ad to run). That being said, you’re only charged when someone clicks your ad. The best products to promote are ones that have a broad appeal. If you go to the Clickbank Marketplace and just click the search button (without typing anything in), Clickbank will return their most popular products. If you look at the top 10 products from that list, they almost all have a broad appeal and are a good fit for native ads. But don’t leave anything to chance here. Check out this super cool native ad spy tool. With this spy tool, you don’t have to guess at whether something will work or not. You can see what other affiliates are promoting. How long they’ve been promoting it. The exact ads (images and headlines) they’ve been using. The landing pages they’ve been sending the most traffic to (which usually means they convert the best). The placements where they’re advertising (the website showing their ads). Honestly, I would never in a million years even think about running a native ad before I did extensive research with this tool. Just my two cents. To be sure that the affiliate product is a good fit, you would like to see that ads have been running for at least 10 days. It’s unlikely an affiliate would keep an ad up and running for 10 days if it wasn’t at least generating some sales. The product I chose to promote was actually the #1 product on Clickbank for a number of weeks: Lottery Dominator. It has a broad mass appeal and it includes recurring commissions for affiliates. Let’s talk about where you’re sending your native ad traffic. For the best results, you have to enter the mind of your visitor (the person clicking your ad). They’re expecting to land on a page that delivers content. Most people really do believe they’re clicking on articles when they click these ads. So, if you send them to a squeeze page, you can imagine the results you’d achieve. But you don’t need to imagine because I already tested it. My conversion rate was less than 6%. Which actually surprised me. I figured it would be less than that. Either way, there’s no way to be profitable if you’re wasting 94% of the traffic you’re paying for. It just won’t happen. Instead, you need to send them to a page that delivers content. Those are the three most popular and what 99% of affiliates use for native ad traffic. In most cases, Clickbank products usually have a VSL by default so it would be possible to direct-link from your ad straight to the product but I don’t recommend it. By all means, test it for yourself but I’ve found that by putting a presell page in between the click and the sales page converts the best. I didn’t swipe this page from any of the ones I found using that spy tool but I did swipe the layout. I just tailored it to this product. When they click the big blue “Watch Now” button it takes them to the product’s sales page. This is just a simple HTML page. I didn’t use any page builders or WordPress for this. Just a really quick simple presell page. The image I used is actually from the affiliate tools page for the product and many people have used that image for the image of their actual ad. I pulled the text from this page straight from text on the affiliate tools page too. Notice that I haven’t had to do any of my own copywriting or anything here! Just simply copy and paste. One major reason this landing page worked so well is that it’s mobile optimized. It’s responsive and looks beautiful on mobile devices. I started this campaign using the data I found while researching with the spy tool. I chose to run it just on mobile devices because I knew the traffic would be cheaper. I tested about 3 other images and 3 other headlines. This one won as far as click-through rate is concerned. I’m not sure which ad produced the most sales because my tracking was biffed for this campaign. I started my CPC bid high because I wanted to get fast data and fast data was what I got. My ad was always in the number one or number two position, which means I got the most clicks. Later on, I started lowering my bid, just to see what it did to my volume of clicks per day. $0.10 per click is kinda the line I found to be the difference between a lot of clicks and not a lot of clicks (if that makes sense). I actually made more than that but had a few refunds come through recently (as to be expected) so I removed them from the transaction detail report above. It’s not complicated. There are no emails to write or list automation or anything technical like that. Heck, I didn’t even use tracking, though I’m not suggesting you do that. Point is, you could have this simple affiliate campaign set up and running in under an hour. No joke. It actually takes longer to get all of your stuff approved at Revcontent. If I did miss something or did a poor job explaining something, please leave a comment below… I’m happy to explain further. amazing results! why not desktop mode device on native ads? Desktop works just as well… the traffic just costs more. Hi Duston. Great article, but I’m really surprised how easy it was for you to get profitable on a campaign. Every article I’ve read about native advertising says that you meed to spend at least 5-$10k to get a campaign just to break even. Did you spend any more money on your lotto campaign besides what is shown in the case study? I’ve been thinking about using native ads but have always been put off by the budget rhe gurus say you need. If you’re running an offer that’s never been run before like your own product or something, then yes, you’ll need a decent sized budget to get to a break even point. But if you’re running affiliate offers that other people have been running for a while then all of that research and testing has already been done. Just use a spy tool like AdBeat and match your campaign to theirs. The hardest part about running native is finding profitable placements. It’s where most of the testing budget is spent. Using something like AdBeat can get you started pretty quickly though. Thank you so much, all of your blog post is always amazing. Can you share that presell HTML landing page that you used for this. Thanks! I created that in Clickfunnels in about 10 minutes… it’s super easy. I didn’t see you optimize your campaign on the traffic side? did that mean you made it profitable even without any optimization? If you did, can you talk more about it? In this case it was profitable just because the affiliate commission is so high ($99/sale). I did have to go back and turn off underperforming widgets/placements. I have the same campaign ended zero sales ?where particularly target? I targeted US and I chose only one category… I believe news/publishing or something like that. Why would you post a screenshot result from a year ago? Because this campaign ran a year ago. Why does it matter? This method works now exactly like it did then and it’ll work five years from now. Hi Duston,Do you recommend to run only one geo at a time? Hello Duston, did you get sales before removing underperforming widgets ? Yes I did, but since the payout was so high I was still able to be profitable. After removing underperforming widgets it became even more profitable. Hi, I want to promote clickbank offers, Should I have a website in order to register to revcontent or mgid? What are their requirements? MGID isn’t as strict but I would have some kind of blog or something set up before registering at Revcontent.